It takes very few conversations these days to understand it is very hard for individuals who view the world from one perspective to hear, understand, and appreciate an alternative point of view. Increasingly, we watch different news sources, read different publications, and have a hard time agreeing on what is “fact” versus what is “fake.” It is easy to stick with our safe set of comfortable friends and colleagues and shake our heads, agreeing that those other guys are foolish—or worse. And everyone involved becomes more entrenched. A worse scenario for flexibly creative thinking is hard to imagine, yet when have we needed it more? 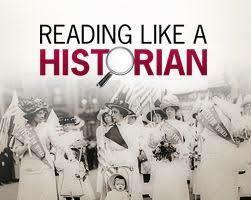 I thought about that dilemma as I reviewed the Stanford History Education Group’s website, Reading Like a Historian. The materials include a series of lessons framed around a central historical question, to be investigated via primary source materials. I generally love history lessons that focus on primary materials. They can bring the story back into history, make the characters as real as any soap opera (and better than most), and help students envision the inquiries that constitute genuine history. In this situation, A and B disagreed about X. How did their perspectives on X affect the way they viewed one another? When A and B were in conflict, what strategies did they use to solve their problems? How did their views about the other side affect their problem solving? Have you known of a situation in which two groups disagreed so intensely they had trouble solving problems together? For example, even high school athletic rivalries can affect community problems. Helping students consider how perspectives shape our choices, both historically and in the present may help some of our current conceptual gridlock. At least I have to hope so, for creative solutions.